A to-do list for the visitor to Charleston, South Carolina must include a few (or more) eateries. Charleston is the oldest city in the state of South Carolina, and has had time to really simmer up it’s unique food culture. Located on Charleston Harbor, locally described as “where the Cooper and Ashley Rivers come together to form the Atlantic Ocean,” the city is a mecca of authentic Lowcountry dining. 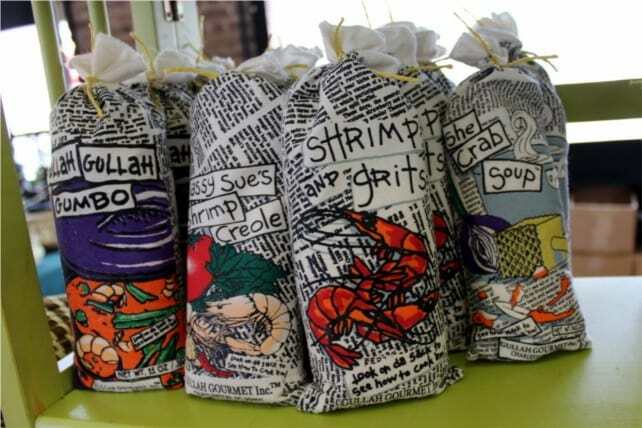 This isn’t just Southern cooking, this is Southern cooking that celebrates the rich diversity of seafood from coastal estuaries, combined with Carribean and Gullah cuisines. Here in Arkansas, I always make sure that we have Hoppin’ John or some variation for New Year’s Dinner–it’s considered good luck. But the Lowcountry is where the dish comes from. Did the name originate from a crippled old man who sold peas and rice in Charleston, or from children hopping around in anticipation? No one seems to know, but it may have something to do with the mispronunciation of the French term for dried peas, “pois pigeons.” If you want an authentic version of this rice and black eyed pea dish go to Hannibal’s Soul Food Kitchen. The setting isn’t fancy, but if you want authentic Lowcountry soul food–this is where the Charleston locals go. Benne is the Bantu word for sesame seeds, which were brought from East Africa, through West Africa, and then to the southern United States with the slave trade. Sesame was planted extensively throughout The South. This family owned business has been selling benne wafers since 1940. 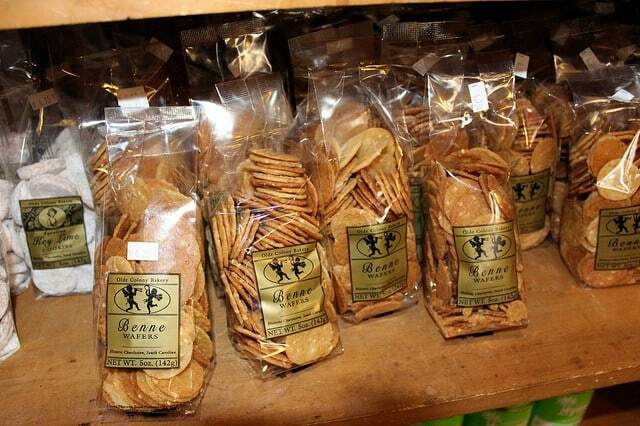 Olde Colony Bakery says: “The Benne Wafer is a thin cookie, made with tasty toasted sesame. Our Benne Wafer recipe dates back well over 100 years and is said to be the only existing original Benne Wafer recipe.” You can find their wafers in local grocery stores or visit their bakery in the Charleston suburb of Mt. Pleasant. Frogmore stew is said to have originated in Frogmore on St. Helena Island, a little town with a post office on one side of the road and a country store on the other. In different areas of the Lowcountry it goes by different names like Beaufort Stew, Lowcountry Boil, Shrimp Bog, or Shrimp Boil. At one time it would have been a poor man’s stew consisting of whatever was on hand cooked together in one pot. Today most people seem to agree on a mixture of the following: shrimp, corn on the cob, sausage, red potatoes, and Old Bay Seasoning. The family owned Bowen’s Island Restaurant, dating back to 1946, is known as a no frills cinder block outpost with all you can eat oyster tables, but it’s also known for it’s Frogmore Stew. This restaurant may be only 30 years old, but the address has been there for 300 plus years. This fine dining establishment in the French Quarter has eleven separate dining areas including a turn-of-the-century courtyard featuring a mammoth Magnolia Tree. 82 Queen is so well known for their she crab soup that they even offer a mix for sale so you can make it at home. What is she crab soup? Well, the soup is named for the female crab, to be specific, a pregnant one. The soup features crab roe in a rich soup similar to bisque, made with milk or heavy cream, crab or fish stock, with a small amount of dry sherry. Sometimes it is thickened with pureed boiled rice, and may include such seasonings as mace, shallots, and/or onions. Shrimp and grits seems pretty self-explanatory, but there must be something special about James Beard Award winning chef Robert Stehling’s version, as they are continually named Best Shrimp and Grits by Charleston City Paper. The restaurant is housed in a historical Charleston building from the 1800s that was a former barbershop. Hominy Grill is known for its reasonably priced down home Southern dishes and has been featured on Rachel Ray’s Tasty Travels and $40 a Day. Clean your fresh shrimp and set aside. Brown bacon until crispy and set aside. Drain the bacon grease, reserving 2-3 TB in the pan. Add your shrimp and saute. In another pot start your grits by the directions given on the bag. Cook until thick constantly stirring. Then add your cheese, stir in and set aside. After shrimp is done, remove it and set it aside. In the shrimp pan add your flour to the bacon fat, then add your water and whisk until it thickens. Dice up your scallions and ham and break up your cooked bacon. Put your grits on a plate and top with shrimp, bacon, ham, scallions, and mushrooms. Then spoon gravy on top and top with shredded cheddar cheese. Melanie Goad is a freelance contributor to All She Cooks. She has a strong background in sales and retail management. She enjoys recipe development, crafting, photography, and travel writing. Melanie's blog is From Scratch. You can also find her on tumblr, Pinterest, Linkedin, and Google +.